Manu and Dayel are the family drivers and they think we are hilarious. They speak just enough English to tell us so, or maybe it’s just something in their eyes. 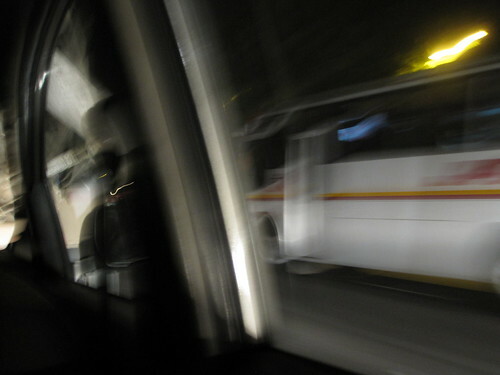 On the night of the party, we’re in Dayel’s car, which is scary because Dayel drives like he’s rounding the curve in a NASCAR race but really, he’s driving a van in bumper-to-bumper traffic on a Saturday night in the second largest city in the world. There are no discernible traffic laws in Delhi, no stop lights, no lines in the road. Most cars carry no insurance. The city’s pedicabs have no working headlights or tail lights, and they account for every third vehicle on the street. By the time the party is over, when we are happily warm and a little tipsy and piled into Dayel’s car, when he is blasting Hindi dance music at top volume, as he accelerates, foot to the floor, even though there’s a truck twenty feet in front of us, Jen realizes that she knows exactly how to drive a car in Dehli. She’s sitting in the front, on the passenger side but on the left. Her stomach has been iffy all night. It seems, in this moment, that she is exactly right. That here, a horn is a turn signal and speed is the only chance at survival. Dayel swerves to the left and we see what he’s trying to do. He’s trying to create a fifth lane of traffic to the left of a long line of trucks, but the space between the trucks and the guardrail is so tight. It barely looks wide enough for our car. And he laughs, because he’s going to do it anyway, and because we have no idea how this works and we think we do, because we’ve driven Toyota Camrys and Chevy Cavaliers on the streets of suburban Massachusetts and Texas and New Hampshire. He does it and we shout some more, and when a car suddenly appears in his makeshift lane, he swerves back, falling into line behind a cement truck with the words, HORN PLEASE painted on the bumper. Dayel obliges. “What are all these people doing out?” asks Jen. “It’s Saturday night in New Delhi,” says Katie. We pass through the same neighborhood we did on the way, a tangle of low, neon-lit hotels that had been choked with hollering street food vendors, and stores crammed in with endless piles of things – plastic, glass, electronics, live chickens – only it’s silent and dark now. The shops have lowered their metal grates. The sidewalks have cleared. Still, Dayel does the same thing he did on the way: He locks us in. We joke that he’s trying to keep us from trying the street food – something we’re all fairly desperate to do – but we know that’s not the reason. It takes us twenty minutes to get home from the party. Abiding by the American-style speed limits in our minds, we estimate that it should have taken an hour. We will learn later that Dayel and Manu had a bet about who could get us home first, that there was beer riding on it. We are not sure how the results were tabulated, or who judged, but we’re guessing that Dayel won. For Manu to have beaten him would have taken miracles – and a sixth lane. When I hold out my hand to the bracelet seller at Babu Market, I expect him to touch my wrist, but he doesn’t. Instead, his hand cradles the widest part of my fist, the breadth between my pinky and thumb knuckles. An instant before, Mrs. Sahrawat dropped the sari across his table of bangles, a bright folded square of gauzy pink netting with an elaborate appliqué of silver beads and sequins. He ponders this for a moment, nodding. That’s when she gestures for me to show him my hand. I have this panic about doing things wrong, mostly because I am always doing things wrong, and my heart sinks when I realize that I have given him my left hand – the only one not laden with shopping bags. Alas, a taboo instantly trod upon, and I’ve been in India less than 24 hours. He doesn’t seem to mind, though, because he reaches for me without a blink, takes a moment to make his determination, drops my first, and gently pushes the sari aside. He works quickly, selecting from one section of his table. The bangles are arranged in long rows by color, threaded onto dowels. He finds a pink that is nearly identical to the color of the sari, pulls up the dowel, and chooses a thick handful. From another section, he chooses some with white crystals, and from another, a stack that’s inset with pearly little beads. Then he arranges them, flipping them over using both hands and they move as fluidly as a slinky, first a pink one, then a white one, then a silver one, so they form a regular pattern. He puts them in a box that looks like it’s been fashioned, by hand, from some other box, from a whole other generation of boxes. Like it’s descended from a long line of boxes. It’s covered in paper that says “S. R. Bangle Store” and has an illustration of a bird holding a bracelet in its beak. He moves on to Tanya, and when he touches her hand, he ponders for a little longer and says something, barely audible and in just a few words, to Mrs. Sahrawat. “This is harder,” she says to us. 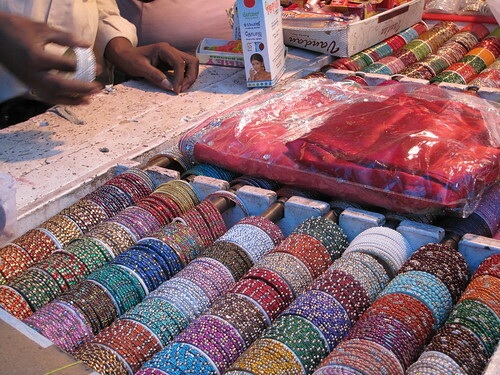 We assume, for a moment, that we’re going to move on to another bangle stall. There must be others in Babu Market, just like there were more shoes, more dress shops with spangled frocks folded into bags upon bags, more stalls for menswear and rhinestone-studded purses and bindis. Mrs. Sahrawat drives a hard bargain and her strongest chip is the most elegant one – refusal. If she can’t get the price she wants, she shrugs, turns down the corners of her mouth, and goes to another stall, leaving the merchants shouting at her back. But then, the man hollers up to someone standing above him, on the roof, it seems, of the stall across the aisle. There is a room up there with a jagged tin roof and a riot of boxes and packages inside. An instant later, there is a shopping bag on a pulley sliding across the aisle, down to the bangle seller. He pulls out a new set of bangles in Tanya’s size and does his sorting trick, one bracelet at a time, settles them into a different kind of box – also recycled from another box. We try to pay, but Mrs. Sahrawat refuses our money in the same way she rejects the sellers who won’t budge on their prices – coolly, and without question that negotiations are over. 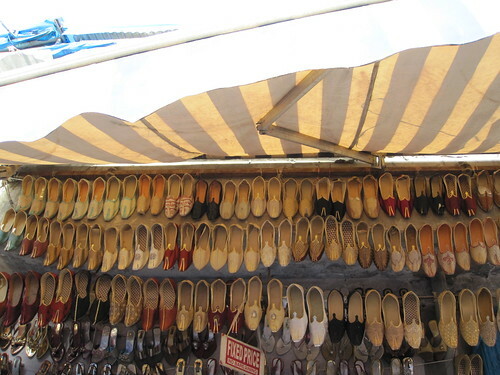 We add the boxes to our bags, to our growing stash of wedding stuff, and continue on to a wall of glittering sandals. We have been in India less than 24 hours. The course of action for the rest of the day is set: Hold out your hand and give it a moment to size you up.